All efforts made in photographic documentation of cases in dentistry loose their value if the images captured don’t match the ones taken at prior appointments. This is where standardization comes to the rescue. Standardization is the art of MAKING images for a case. Its involoves standardizing everything right from equipment, to patient position, posture, appearance, composition of the image and finally the camera and flash setings. In this part I will work u through the standardization of equipments. 1. CAMERA- any entry level camera (dslr) is good. It is a wise decision to invest more on a great flash system as compared to the camera because light is the most important aspect of dental photography. 2. LENS – a 100mm macro lens is IDEAL for dental photography. These lenses allow the dentist to maintain a respectable distance from the patient even at a magnification of 1:1. Other options are 85mm, 90mm and 105mm. P.S. : 18-105mm, 75-300mm etc. Also have a 100mm focal length within their range but these are NOT macro lenses and hold NO usage in dentistry. 3. FLASH SYSTEM- a dual point flash system “MT24EX” by Canon is the most ideal for dental photography. This system standardizes not just the movement of both the flashes in all 3 axes but also the power output. The most important feature however is the presence of an external contant source of light. 4. TRIPOD for extra oral photography- it ensures that the camera is exactly at the eye level making verification very easy and minimizes subtle angular changes made by the dentist will he holds the camera. 5.BACKGROUND- always use a white background for extra oral photography. A Slave flash kept behind the patient ensures that the final image has NO SHADOWS on the white background because of the master flash on the camera. A white background easily sets off the patient and makes important anatomical landmarks stand out making it the best choice for backgrounds. Always use transparent retractors for retraction also use of half retractors may be better for certain shots. Retraction should always be laterally and forward and not backward. Finally use of black contractors where ever possible provides an excellent background. More insights into standardization coming up in the following sections… Till then HAPPY CLICKING! 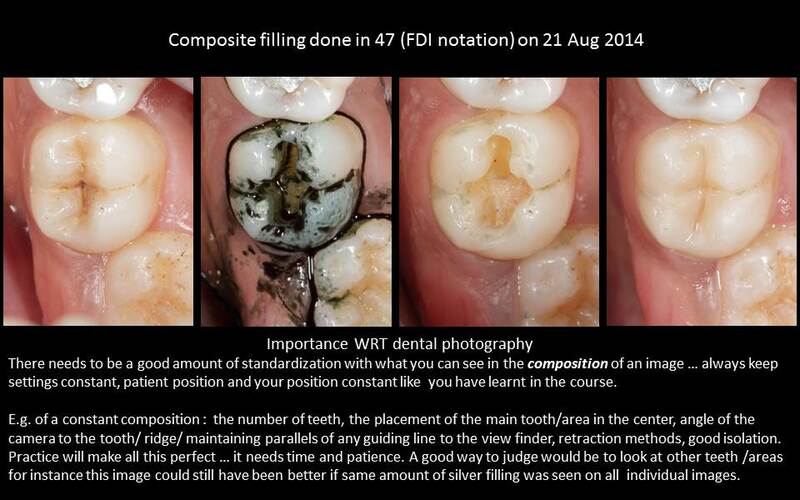 TOP 10 ways to achieve standardization in dental photography with respect to image composition.